getting home at 7pm is fine. having to work late and not making it home until gone 8:30pm makes me grumpy*. and hungry. delicious dishes that i can turn around really quickly are an important part of my cooking repertoire. making them something a bit special is even more important, particularly for David, given the grumpy-factor that is at play as i slump in and wait for my food to be ready. somehow prawns always up the special-factor so this dish is a regular stand-by. this dish is my contribution to presto pasta nights, as hosted by ruth at once upon a feast. heat the olive oil and fry the garlic and chilli until soft and fragrant. 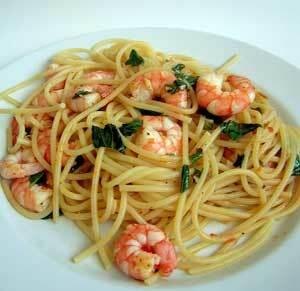 when the pasta is almost ready add the prawns to the garlic/chilli mix plus the lemon juice and cook through. mix with the pasta and basil and serve. * i know that some people will think this is fine but given i leave the house at 7am, i don’t.